Each year, NCCLF partners with Fresno State University to hold a competition that provides students with the opportunity to combine hands on experience with classroom theory. Undergraduate students from the Lyles College of Engineering, the Department of Art and Design, and the Humanics Program are invited to participate in the Fresno Community Facilities Challenge. Students are placed in teams to prepare a real estate development proposal for a community facility project of a local government entity or community-based organization. This year’s Challenge focuses on shared space facilities, a major area of focus for NCCLF’s Consulting Department, a recognized leader in developing innovative approaches to securing nonprofit space. The Challenge competition culminates with an oral presentation in front of a panel of judges comprised of local industry experts. 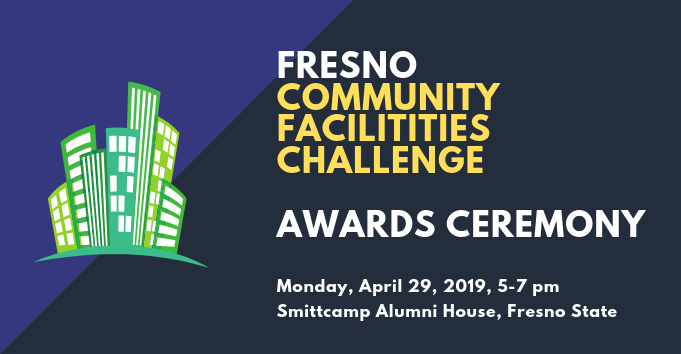 The year’s winner will be announced at a public awards reception on Monday, April 29th from 5-7 pm at Fresno State University’s Smittcamp Alumni House. We hope you can join us! For questions, please contact Kiel Lopez-Schmidt, NCCLF’s Central Valley Regional Manager at kchmidt@ncclf.org or by calling (559) 452-0327.